Need a light, healthy and easy to prepare meal? 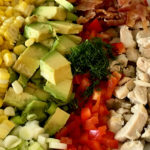 This avocado chicken salad may just be what you are looking for! I wanted something different from the typical chicken salad that is held together by mayonnaise. The avocado chicken salad tossed with the dressing. But I already had a delicious chicken salad recipe that contains Greek yogurt instead of mayo: See No Mayo Chicken Salad Recipe. This time I wanted to kick it up a notch. I needed a chicken salad dish that would provide me with diverse flavors and textures. So I opened the refrigerator to see what I could come up with! To get started, I grabbed a couple of chicken breasts and diced them up. These were raw chicken breasts and I knew the fastest way to cook them was in smaller portions and in the Instant Pot. Dice the avocado before scooping it out. You don’t have to have an Instant Pot for this recipe. You can use whatever you like to cook your chicken. And if you have diced or shredded chicken in the freezer, you can use that as well! I placed the chicken in the liner of the pot with some chicken broth. And in order to save more time, I placed the trivet over top of the chicken and placed leftover corn on the cob on top! Yes, I was able to cook both of them at the same time! A HUGE time saver for me. Again, you can use whatever cooked corn you have on hand. I just love the flavor of the sweet kernels right off the cob. But feel free to use frozen or canned corn – use whatever you have on hand! As the corn and chicken were cooking, I prepared the dressing. I threw all of the dressing ingredients into my food processor. Delicious cilantro lime dressing. Great to use on salmon too! Because I wasn’t making a lot of dressing, I used the smaller bowl of my Hamilton Beach Duo Food Processor. If you use a large food processor bowl, you will need to pulse the dressing and scrape down the sides to make sure all of the cilantro is incorporated. By the time that I had the dressing made, the chicken and corn was cooked! 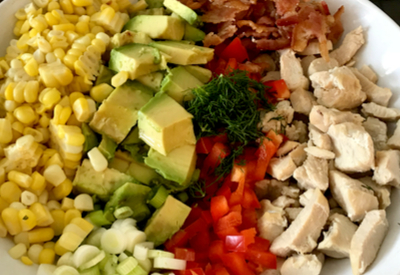 It was time to assemble the avocado chicken salad! To make it easy on yourself, dice the avocado before removing it from the outer layer. Just run a knife in both directions and scoop it out the diced chunks with a large spoon. We even dice our avocado this way for our Avocado Smash Toast. Add everything to a large bowl and drizzle the dressing over top. All of the ingredients lined up and ready for the cilantro lime dressing. I only use about 2 tablespoons of the dressing. I find that is plenty to coat the salad and as a bonus, I have leftover dressing to use in other recipes! A healthy chicken and avocado salad flavored with fresh dill and topped with a cilantro lime dressing. Prepare the dressing by placing all the dressing ingredients into a food processor. Pulse until well combined. Add additional oil or water if needed. In a large bowl add the salad ingredients. Pour 2 tablespoons of the dressing over the salad and toss. Taste and add additional dressing if needed.